He was born in Punxsutawney, Pennsylvania on August 11, 1945. During his youth in Clearfield, Pennsylvania,, he became an Eagle Scout and was an honor graduate from Clearfield High School. 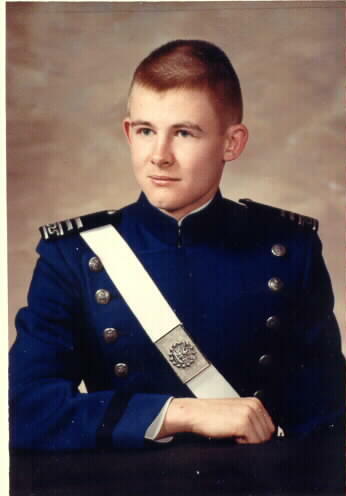 He graduated from the United States AirForce Academy in 1967. Following graduation he completed Flight Training and earned his wings at Laradeo Air Force Base in Texas in 1968. 1973 found him assigned to Vietnam. On November 27, 1973, while flying a mission over Cambodia in an A7-D aircraft, he was shot down and killed by enemy fire. His body was subsequently recovered and returned to the United States. On December 5, 1973 he was laid to rest in Grave 7310, Section 31 of Arlington National Cemetery. He was survived by his wife, Marsha, daughter, Heather Ann, a loving sister and his mother and father, Catherine and George Scott. Following his death, the Boy Scouts of American dedicated a dam at Camp Mountain Run, Pennsylvania, as the "Charles F. Scott Memorial Dam." This information was provided by his cousin, Dave Byers. Photo Courtesy Of Dave Byers.